Since 2008, total cash sales have increased dramatically. From 2001 through 2007, cash sales ranged from a low of 27,381 to 51,387 per year and represented only 6.2 percent to 8.4 percent of total market sales. In 2008, as the housing market collapsed and prices plummeted, real estate investing became more attractive and cash buyers returned to the market. 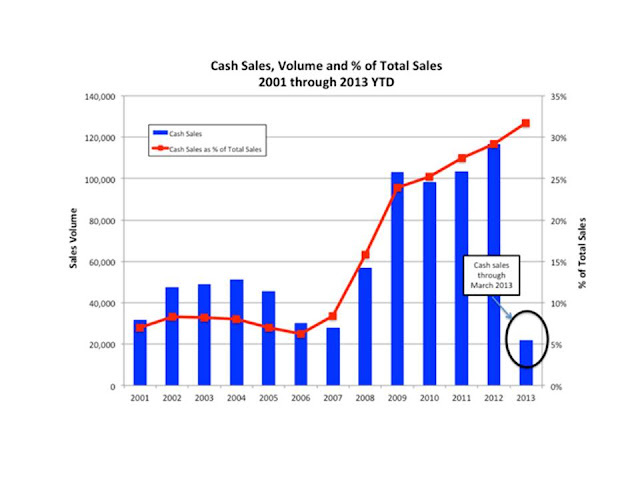 In 2008, cash sales were 57,019, or 15.9 percent of total sales. By 2012, cash sales had swelled to 116,549, or 29.2 percent of total sales. So far in 2013, cash sales are 30.2 percent of total sales (which is also the case in San Francisco, specific). Naturally, Sellers prefer offers with strong (all) cash positions as there is no (little) hassle of dealing with a bank / lender, and potentially having the sale not close due to lender underwriting and bank requirements. For those of you, who are not flush with cash and need to leverage, do not let the competition discourage you, as “where there’s a will there’s a way.” You will simply have to offer stronger terms and find a way to differentiate yourself from the pack (tug at the heartstrings of a Seller with a personal letter, as an example). Feel free to reach out to me to discuss other strategies I employ: 415-317-4546.